On Friday was the monthly sit and sew evening for the Melbourne Modern Quilt Guild (MMQG), which as usual was a terribly fun night out. It’s quite a lot of sewing, chatting (a little shopping) and a little prize-winning. It’s great to have a time to hang out with fellow fabric addicts, and be able to discuss techniques, tips tricks and general know how. If you’re in Melbourne and want to/currently quilt you should join the guild. Do you know how much faster projects go when you have 3 hours dedicated to sewing? And if you run out of thread/break a needle…no pauses, just go downstairs and buy your supplies! The Friday night SASE events are held at GJ’s fabric. I have a small confession to make. Somehow I am a serial prize winner. From Jelly bean competitions to raffles, to a wine weekend in Adelaide, I have been very lucky. 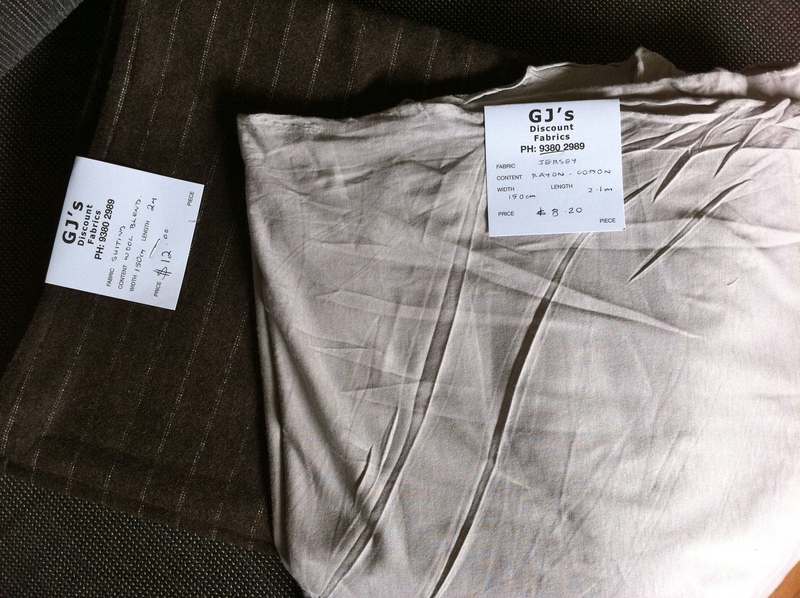 On friday I won a door prize, a $20 gift voucher to GJ’s fabric. The quilting fabric there is divine, but for some reason (lets call it fate) nothing was inspiring me for purchase. Nothing! When has that ever happened? Then Rachel of Mymessings started to show me the garment fabric…and again my lucky streak came into play. Look at these two cuts! 4 metres of fabric, and it was $20.50. The first is a wool blend, which I’m thinking a cambie? If game perhaps a thurlow? The second is earmarked (depending on cutting requirements) for a Tiramisu dress by Steph’s new sewing pattern line cake. Seriously, a nice grey summer dress just for casual lunches and baby activities. It’s a great colour for hiding baby snot really. Too much information? If it is too small a cut for tiramisu, then perhaps some renfrews, or even a cardigan/wrap? Any other suggestions? It’s a very lightweight soft knit.